110 Apr 20/13 I had said that yesterday's barn was my favorite barn to shoot on the way to the city, but this is my favorite barn on the south side of the highway. Yesterday's was on the north side. This one is a little tougher to photograph because of the metal roofing and with any sun the reflection's are blown out. Really fantastic landscape; beautiful tones and that blue/green color gives it the perfect punch! Beautiful scene! Beautifully composed. Love the barn! Really cool old barn, I like that it's green, most are red. Well shot. 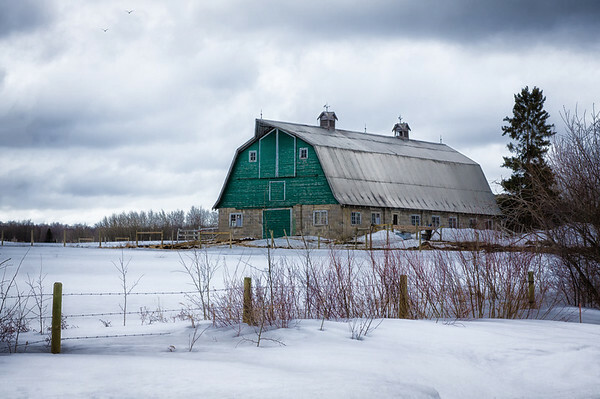 Neat old barn. I noticed a couple of birds in the upper left. Canada geese, maybe. Returning for spring???? you captured this wonderfully! I shot it awhile ago on a sunny day and it was blown out.